Copyright © 2002-2018, Mark Douma. All rights reserved. NOTE: I originally wrote the following article about PressReady in OS X in the fall of 2002. Much has changed in OS X since then, but unfortunately, I haven't had time to update this section of my webpage. Back in the fall of 2002, I was primarily concerned with using the HP 1220C/ps to create a portfolio of my graphic design work in order to find a job in graphic design (which is what I got my degree in). Since I am now instead developing Font Finagler fulltime to earn a living, I'm not as pressed to find a solution to this issue (though I really wish I could). In the past 5 years that I've taught myself how to write software for Mac OS X, my knowledge and understanding of OS X has deepened significantly. While the following information about the types of applications is fairly accurate, I have since learned that it's an oversimplification. The solution presented on the next page won't work with later versions of InDesign, since they can no longer be launched in Classic. I will leave the contents as is, however, for what it's worth. Originally written in Fall of 2002: At first, after reading the threads in the Adobe forums, I figured PR wouldn't work at all under OSX (in Classic). I installed it in Classic and had errors when trying to print, confirming my erroneous assumption. 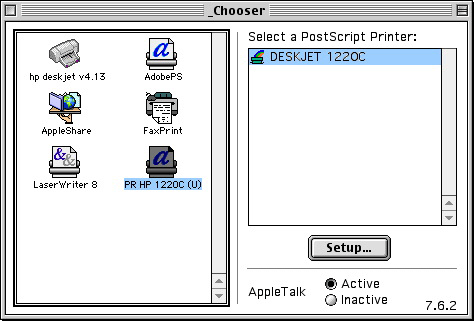 After booting into my classic os 9 partition, deleting all the printing prefs, desktop printers, and reinstalling PressReady, I can successfully print in OS X from Classic applications using the PressReady driver. As far as getting PressReady to work in the Classic environment, I would recommend rebooting into OS 9 natively if you can (not from within the Classic Environment in OS X) to install PressReady (Basics) from there. I've found it much easier to comprehend what's going on that way, since OS X separates you from the OS 9 desktop, etc. Once you get PressReady working in OS 9 (natively), when you reboot into OS X and use that OS 9 installation as the Classic environment, you should be all set. So we now know that PressReady will work just fine in the Classic environment as a Classic Printer driver. Programs that run in Classic, like QuarkXPress for example, will work just like they would if we were booted up in OS 9 natively. To print, first go to the Chooser, and select the PR driver for your printer on the left side, then select your printer from the resulting list on the right side. Then go to Page Setup to choose your options, and then proceed to the Print dialog box. In the Print dialog box, be sure to choose "Foreground (no spool file)" under the "Background Printing" option from the drop-down menu. This should increase the reliability of printing. While the Classic environment is busy processing the print job, you can continue to work in native OS X programs until it finishes. The next logical question would be: "what about native OS X applications--is there some way to print from a native OS X application via a Classic printer driver?" That way, we could still take advantage of what PressReady has to offer. You can see from the diagram below that the OS X native environment and the OS X Classic environment are separate from each other at least when it comes to printer drivers. Classic software will only interface w/ Classic printer drivers, and OS X native applications will only interface w/ OS X native printer drivers. However, there is a feature of Carbon-based applications that we can use in order to bridge the gap between the OS X native environment and the Classic environment.